Bob this is a great little project and should be treasured by the young man. You are a generous LumberJock my friend. Very nice box, Grizz. I really like how so many of your projects have great stories behind them. Wow! Love the inlay’s! Nice combination of woods too! Not every creative piece of art has to be with exotic woods. I am sure it will be cherished! If not he can send it to me. LOL! Cool box Bob. I’m sure the young man will cherish it, especially with it’s connection to his cabin build. Neat project, Bob. It fits your description of this boy to a tee. thank you you guys for your very nice comments, they mean a lot to me. 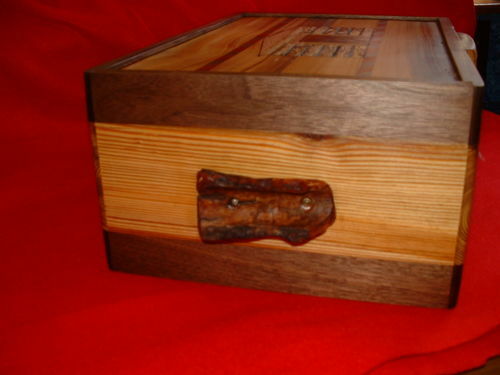 Beautiful box grizz. He will love it. Another dazzler Bob your creative juices just keep flowing along with your kindness. 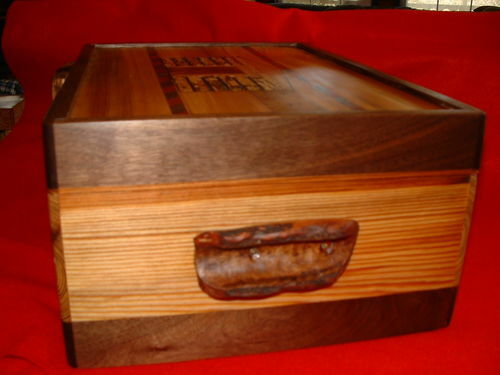 A gift that will bill remembered for a life time and who knows perhaps jack may become inspired to become a woodworker . Unique and great looking box! Exceptional design and quality. What and how did you do the ” saw” design on the front of the box? It looks very nice and well done. This kid hit the jackpot with this box and I am sure he will treasure it for a long long time.